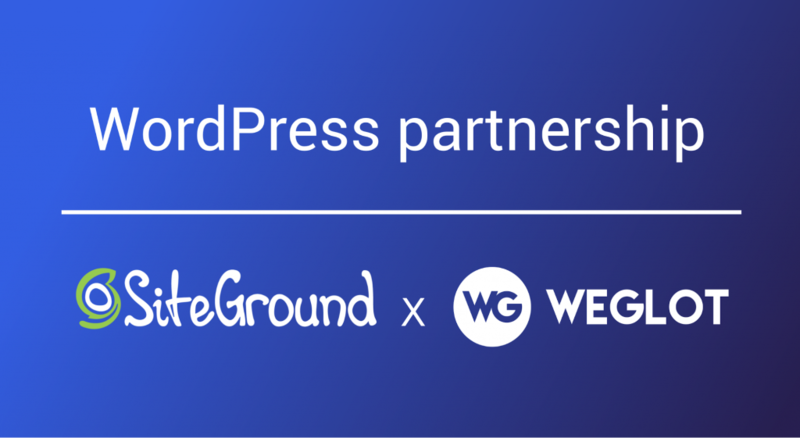 We’re very proud and happy to announce the recent partnership between SiteGround and Weglot. It reflects our continuous focus to collaborate with best players of the market to deliver best in class services to our users. Weglot recommends SiteGround as one of the best WordPress hosting solutions available. SiteGround provides top quality managed web hosting packed with great features and it is not a surprise that the company is recommended by WordPress.org. On the other hand, SiteGround recommends Weglot to its users, among its suggested plugins list (next to other great solutions such as WP rocket), as one of the best WordPress multilingual solutions for WordPress. Founded 14 years ago, SiteGround now has 400+ happy employees, 5 data centers in Asia, Europe and North America, uncomparable customer support and truly managed hosting service at incredibly affordable prices. SiteGround is known for their in-house crafted solutions and are usually one of the first to implement innovations, as the mission of the company is to make sure their clients’ sites are as fast and secure as possible. Today SiteGround hosts more than 1 million domains worldwide and achieves over 95% client satisfaction rate for a fourth year in a row, proof of the high quality of the service! Founded in 2016 and based in Paris (France), Weglot is now powering more than 20,000 websites, helping them to successfully display and manage their businesses in different languages. With more than 500+ five-star ratings on the official WordPress Directory, Weglot is now the most 5-star rated translation plugin.